The Blessed Virgin Mary appears to Valerie in a constant manner on every 25th of the month. From 1998 – 2000 the Blessed Virgin has appeared to Valerie 3 times a month on 2nd, the 13th and 25th. Every date of the apparition has a dedication / purpose, the 2nd was dedicated to the Non-Believers – it’s a private apparition and had no message published, the 13th was dedicated to Her Duty and Grace – a private apparition and had no message published – and the 25th is dedicated to All Her Children – a public apparition and all messages are published. 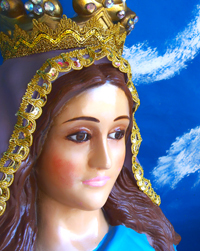 From 2001 up to 2013, the Virgin of Grace of Aruba has been appearing only once a month to Valerie, on the 25th. 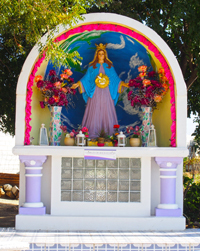 In the latter part of 2014 the Virgin of Grace of Aruba started appearing twice on the 2nd and 25th and in the last 3 months of 2014 until today, the Virgin of Grace of Aruba is appearing 3 times a year again, just like in the earlier years. In January of 2015 the Virgin of Grace of Aruba asked Valerie to publish all 3 messages, not only to give strength to Her apparition, but also due to the urgency in the situation of the world. 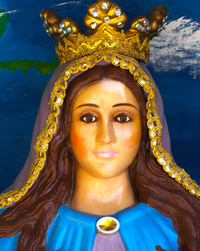 The Virgin Mary told Valerie that She will keep appearing to Her – She always ends her messages in a form like this: the Virgin of Grace of Aruba, forever. First I have to say .. She is so beautiful, it’s difficult to put Her beauty into words, nonetheless I’ll try. As the window of time of the Virgin Mary’s public apparitions (25th of each month) are known, the Visionary always prepares to receive Her. In this preparation 1 Holy Rosary is prayed with a lot of devotion. On the day that the Visionary receives the apparition she is only allowed to eat minimally with the meaning of fasting, she drinks a lot of water, rests and prays in order to be ready to receive Her apparition. Before the apparition, the first thing that gets the Visionary’s attention is a thick ray of white light that descends from heaven. The Visionary opens her eyes and looks up and always sees clouds that descend in front of her, the colors of the clouds are soft grey, soft blue and white; after this Virgin descends slowly bare feet in the clouds. The Virgin’s arms, hands, legs and feet move and She is always smiling, even if She is in pain. She settles in the clouds, though her feet are visible under the clouds. The clouds move throughout the bottom part of Her dress. The Virgin floats literally, her eyes and her body shine incredibly. The Virgin Mary’s apparition as Jesus’ apparition is sent by God the Father. In the back of the Virgin image there’s the world, of which half is in darkness with stars and half is in light. The meaning of this representation of the world is that we are in a balance. 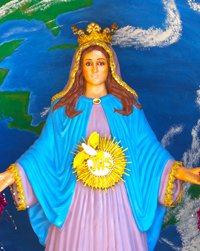 On the Virgin Mary’s private apparitions to the Visionary on the 2nd and 13th of the month, the Virgin of Grace of Aruba comes in the very early morning hours (the times vary). The Visionary is awakened by the Angels of Koyari announcing that the Virgin Mary is on Her way. She wakes up, prepares and she’s driven to the Chapel by her husband. She prepares her white clothing and any other items, such as her Rosary, a white candle, a pack of matches, her veil, sandals, fresh flowers from her garden, etc. before she sleeps, in order not to waste any time. 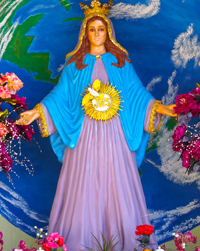 The Virgin Mary’s clothing is specified for the island of Aruba. She has a long purple dress, not too wide with at the bottom edge a string of instances of 3 colors of roses: red, meaning love and the remembrance of the blood of Christ – white, meaning life and light for the world – and gold, meaning God who is My Son. The green leaves mean that we need to keep blooming this miracle. On top of her dress she has some type of wide jacket of a soft blue color. The two colors, purple and blue, represent the colors of the sky of Aruba during sunset. Her veil is the same color as Her dress – light purple; The edge of her veil and the light blue top have a gold colored strip. She also has a golden string around Her waist. 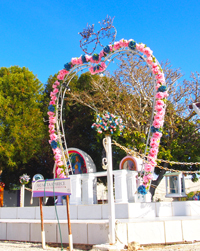 The Virgin Mary has appeared to Valerie in the early beginning in her room at Modanza, also in the chapel at Modanza – since 2000 the Blessed Virgin appears at Koyari, behind the arch which is located on a pedestal in front of the large Cross. The Virgin Mary has also appears in the Chapel on the 2nd and the 13th of the month and has also appeared in the Chapel on some 25th of the months, mostly due to rainy weather conditions. In 1999 the Blessed Virgin appeared to Valerie at the hospital, after she gave birth to her second daughter, Divienne. At this occasion the Blessed Virgin came to Valerie with a strong wind while she was sharing a hospital room with 4 other women, of which 2 were not Catholic. All witnessed the curtains moving heavily while in the air-conditioned room. The Blessed Virgin came to Valerie and told her “Congratulations. I’ve come to you to give you strength – you and your child. Your child will work for the Lord because she is a very special child, who will follow in your steps. All those sharing the room with you will convert and remember, tell them there’s only one God. What they lack in their religion is Me. It is My Son’s word that He always worries about Me. They will change to the true religion as soon as I go. When I go, they will have peace and love in their hearts. Something else, I ask you My child, you have nothing else to do in here. Prepare your bags and go home. Because you are healthy. All those children born on the same day as your child will meet each other everywhere and My Son will guide them, because this is the group that is tomorrow’s future.” I can say that all other 3 women have given birth one day before me and through operations. I would get up, brush their hair, help them walk, help them bathe, because they were in a lot of pain. I thank God that I haven’t felt anything, since I was thinking that My child still had to be born. For this I was relaxed to bring My child to this earth so that she could also be a member of this world. The Virgin Mary has also appeared to Valerie in 2000 in Medjugorje when she was there on a trip with her family as requested by Jesus, in order to communicate with the Visionary there, but she could not reach her to talk to her. The Virgin Mary has shown to like flowers, and candles to light our lives. She also always seem to appreciate us to take good care of ourselves. She also likes us to give each other religious gifts. Also, what the Blessed Virgin Mary likes is for people to distribute Rosaries, Scapulars and leaflets / stamps, so that when you have it in your hand that you could remember Her. This fills Her with happiness. This way you learn to appreciate what She sends to you. The Blessed Virgin has a very soft character and She cries a lot. She is so sweet that you want to hug Her a lot. She worries a lot about everything that worries the Visionary and cries when Her Son, the world or her Visionary is hurt. She likes to smile She’s happy. Sometimes the Virgin asks the Visionary during the apparitions if she wants to take Her picture. The Visionary answers Her that the people should believe without seeing and She, as the Mother of Christ answers “This is the way I like it.”. If one day anybody could see Her, I would be very happy. Because She is not only a miracle, but She is a gift. How many gifts hasn’t She offered to the world already? Many. This is why we should learn to give the value to what is from God. This is why I ask, anyone who has this gift, help so that this gift can become greater. Because if She has come to you, it is because She needs you to work on this world, just as I do. Initially I didn’t know how to get to everything, but Jesus has given me strength to work for the world, to do it by His Will.